Cadalyst is the leader in delivering timely, thorough, unbiased reviews of software and hardware for CAD professionals. Use the links below to browse the archives of Cadalyst Labs Reviews and First Looks. Click here or scroll down for details about Cadalyst Labs Reviews, First Looks, and the Highly Recommended rating. Cadalyst Labs Reviews are full reviews of the latest version of a particular hardware or software product for computer-aided design and related applications. Some Cadalyst Labs Reviews are "round-ups" — that is, a look at a variety of similar products in one product category to provide the reader with an overview of the relative benefits and drawbacks of those products. Many Cadalyst Labs Reviews of hardware are conducted using the latest version of the Cadalyst Labs Benchmark Test. 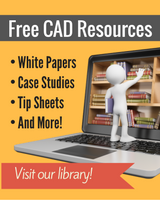 A First Look review is a brief overview of a product that is new to the CAD market. Cadalyst Labs Reviews and First Looks are conducted independently. Product reviewers are paid by Cadalyst and have agreed that they will not accept compensation or perks from the vendor or any other party having a commercial interest in the product. In limited instances, vendors might provide fully functioning versions of software or hardware for review and request that the reviewer not return it. Cadalyst's Highly Recommended rating is an indication that the product meets Cadalyst's highest standards and is an excellent choice for CAD professionals.